This entry was posted on August 13, 2015 at 1:00 am and is filed under Thursday Tangents. You can follow any responses to this entry through the RSS 2.0 feed. You can leave a response, or trackback from your own site. Perhaps I’m one of those dry, stick-like people, but I enjoyed Mists of Avalon, even though I wasn’t too thrilled with the Bradley’s Free Amazons story either. Unfortunately, I recently read about some rather unpleasant allegations about MZB’s personal life from her daughter. If they are true, they cast her work in a rather different and unpleasant light. That is surely true for some forms of literary analysis, but I think that the story (or book or tale or . . . ) stands independently of the author’s personal life. There seems to be a growing trend in some circles to adore or hate authors based upon their politics or tribe or willingness to have a pre-defined and “correct” viewpoint. Such a “my way or the highway” process is well advanced in some areas; such close-mindedness is not merely bad for SF in general, but bad for personal growth. I think that the commentators on this blog have done fair in avoiding that, despite what I infer are some pretty strongly help personal opinions. Exemplary. The distinction between ‘fiction’ and ‘fact’ was nearly as fluid, which I will admit bothered this particular mathematical physicist more than it probably ought to. I missed the fact that the reissue of Puppet Masters was ‘original’. Should look it up. While I wouldn’t argue that the reissued Stranger was better, I did find a couple of places where with the original text some characters’ actions made more sense. Overall, this makes no difference – the same things happened at the same time, they just fit together a bit better. Aside from that, yeah, you’d have to do a line edit to even notice that the extra words were there. 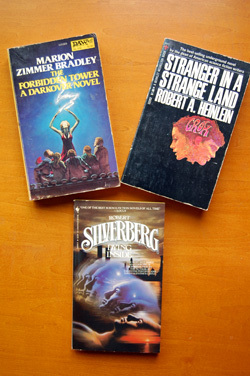 Since “Stranger” was a landmark book for me, I didn’t look at the reissue. I would be interested in an example of one of those places where some characters’ actions made more sense. The academic in me is fascinated by such! I think copying those paragraphs counts as fair use, so I’ll try to find it and send it to you off-line. Can’t promise when, though. Will be off on vacation in a week and going nuts getting it organised.